The Recreation Ground on Islington Road provides an equipped play area for children up to 12 years old, include seats and picnic benches. There is open space for games i.e. football and basketball and a fully equipped skateboard park for wheeled activities. A play area for young children to interact and challenge themselves in a safe environment. There are two play areas on Belle Baulk. An equipped toddler's play area and an adventure play area with a log cabin, balance beams and a tyre walk. 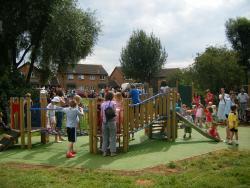 There is one equipped play area on The Shires for children aged 2 - 12 years old. The Riverside Walk runs from Bickerstaffes Road to the Leisure Centre on both the north and south sides of Silverstone Brook. The footpath network has been extended through Belle Baulk along the River Tove to the A5 junction with Old Tiffield Road and links up with the footpath system in the Northampton Road development. 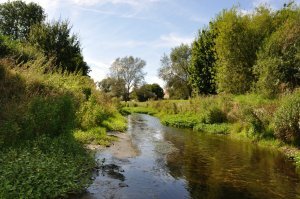 The Town Council is responsible for mowing open areas in the Town and the Highway Verges on behalf of Northants County Council. The council employs 3 litter pickers to regularly litter pick all the open areas in their ownership. Litter bins and seats are considered for areas when requested by the Public. The Town Council is responsible for the supply of over 60 dog bins and disposal of dog waste in Towcester. The Community Centre is situated in Islington Road, Towcester, and is available for hire at a competitive rate. Please contact the Town Council Offices on 01327 350995 for booking enquiries, or online via our booking enquiry form. Every year, the Town Council runs a Best Kept Garden Competition. 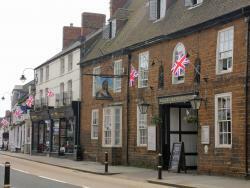 Entries are invited from residents of Towcester via the May issue of the Town Crier. The Town Council works in conjunction with Towcester Business Club to environmentally improve the town during the summer months by organising colourful floral displays for the town centre and again in December with the Christmas trees and lights.